My Verizon data usage spiked yesterday afternoon. I went in and checked to see what version of Chrome I was using and it had not changed but I restarted and checked again and I am now on Chrome 60.0.3112.112. I am also now under a strict data usage diet for the next few days. There was a lot of smoke blown in yesterday afternoon and a LOT more this morning. It seems to be getting worse. I am guessing that it is coming from the Tohakum fire that was started by lightning on 29 August and has burned over 50,000 acres so far with no containment. There are a lot of other fires in OR and ID that may be adding to the smoke and haze which has cut visibility to 6 miles or less. It was shopping day again with a gas fill up for Desperado. When I had those chores taken care of I went to Chihuahua's Grill & Cantina where I got a platter full of Huevos con Chorizo, potatoes and beans. Everything was great but the beans were some of the best that I have had in a long time. It was an expensive tourist priced experience but very good food and excellent service. Unable to bear the cost of meeting these challenges out of yearly productivity, the emperors [government establishment] adopted a strategy of artificially inflating the value of their yearly budgets by debasing the currency. This shifted the cost of current crises to future taxpayers. Such a strategy assumes that the future will experience no equivalent crisis. When this assumption proved grossly in error, the existence of the Empire was imperiled. We were back in town again this morning with a breakfast stop at Sid's. I had their veggie omelet this morning with some good hash browns and better coffee that my first experience, The price was still more than I like to pay but when in a tourist town you pay tourist prices. I then went to the Winnemucca Dust Devils shooting range (an old gravel pit) near the Trap Range which looks like the city has spent some money there. None has been spent on the gravel pit to make it a well set up pistol range. I arrive very early and having a good MIFI connection will post from here. I'll be telling about the shooting and how my day went tomorrow. There are some wonderful customer reviews written for this book but many of them are as garrulous as the book. If you like reading doctoral dissertations then this book is a gem. However, if I had known better I would have read only Chapter 6 and thought it was good. The customer got it spot on when saying it was 'dry' but I disagree about the best part of the book. Chapter 6, the Conclusion is the best part. I read this as a MOBI file that I had converted from PDF at CloudCovert. I thought at first glance that the conversion was better than what I find ar archives.org. That proved to be mostly true. The text is converted better but every PDF page appears briefly on a blank Paperwhite page. The text is poorly line spaced and most of the images are worthless, especially the many graphs. I have another PDF that I have converted so I will see if it is any better but this first try provided mixed results. My shooting yesterday was bad. The only good thing that came of it was confirmation that I need to trade the S & W Governor that I now have for a lighter caliber. The psoriatic arthritis in my left hand is now so bad that I can not grip it properly and the right hand is taking a beating from the recoil. This club had 4 stages with two of them set up at ranges that exceed my capability. I did my usual on the other two stages where the targets were a bit closer but certainly nothing to brag about. Patches handled all the shooting very well but it wore her out. She slept all afternoon until it was time to go walk. The temperature got up to about 92° by the time we finished at the range but there was a breeze and with all the windows open in Desperado it was cool enough for Patches that I did not start up the generator and A/C. However, with the windows closed the A/C ran for about an hour before cycling off after we got back to the Park and plugged into shore power. I think of Pazole as being a winter meal but have had a craving for some these past few weeks. The Khoury's Market is well stocked with Hispanic items so there was no better time to pick up what I needed last Friday. The ingredient that is the hardest to find in most markets is some Saz처n of which I depleted my stock a few months ago. Got that and made up a Thermal Cooker pot full with chicken this morning. This is a book of compiled short stories published in 1916. Most, if not all, of them had been previously published in a magazine starting in 1906. I had read one of the stories, The Weight Of Obligation, some time before and it was not in a magazine nor this book. Can not remember when I read it nor what other book it may have been included. It is a great story but I enjoyed all of them in this book. Recommended! I doubt that you will see this article in any of the Lame Stream Media but the consequences could be enormous. The United States could kiss all the advantages goodbye that the Petro $ have granted for decades. "China is expected shortly to launch a crude oil futures contract priced in yuan and convertible into gold in what analysts say could be a game-changer for the industry. The Pozole is very good and I have a lot of it for more 'linners' this week. It will probably stretch into next week because I will be eating more of my fish 'linners' as well. The high temperature on Saturday was 98 which was good since it remained cool enough until noon for Patches to stay in Desperado without any A/C. Then yesterday we had 102 but if the forecast is correct it will cool down to 101 today and 100 tomorrow. I put very little faith in the forecasts but I sure hope they get it right that starting 7 September the high temperatures will be below 90. Show me! I have self diagnosed my hand, foot and hip pains as being enthestitis a part and parcel of psoriatic arthritis. I am going to start a 10 day regimen of ibuprofen today and see if that helps. I experienced similar pains in 2011 and found that it was in reaction to statin drugs taken for cholesterol. I have been off the statins so it must be enthestitis. Well it reached only 100° yesterday and they have revised tomorrow to be less that 100. Those guesses for below 90 starting on the 7th have also been revised and that is now not going to happen. But, there is still hope for cooler days starting on the 13th with high temperatures in the lower 80s. Can it be true? I am now reading two books that I have on my Paperwhite. Switching back and forth from one to the other after each chapter. One of them was downloaded as a PDF file and then converted to MOBI using CloudCovert. This conversion was done much better including the images although they are quite small . So, CloudCovert can do a good job of converting PDF to MOBI it appears to depend upon the PDF file. This second try produced good text and none of the spacing issues I had with the first attempt. I'm nearing the completion of a two color pixel art drawing but it will probably be another day or two. Only started to think about how I will draw stained glass panel # 44. Spent a lot of time looking for and considering what I will get in trade the S & W Governor. A lot of smoke again this morning. It is probably coming from the Tohakum 2 fire near Pyramid Lake which has now burned a little over 94,000 acres. It is getting some help from the Tungsten fire that has burned a little more than 16,000 acres. That fire is near Dixie Valley (needs a name change to be Politically Correct) and closer to me than the Tohakum. Took on fresh water this morning when the water flow started to show signs of a low level in the tank. I am hoping that the holding tanks can hold it for another day. When I return from shopping tomorrow I'll back in closer to the dump inlet. If I must dump today I'll have to move Desperado but I think I can wait. I sat on my Paperwhite this morning while the USB cable was attached and now have no connection to my computer for additional downloads nor uploading quotes. Promptly ordered another cable from Amazon but it will be a week getting here. That is with free shipping, I could get it in 2 days but the shipping for that would be over 4x the price of the cable - no thank you. The Paperwhite seems to be functioning fine although I may find that I have a problem when I try to charge it. The American people have already had the DACA debate. Hillary Clinton promised to expand DACA. Trump promised to end DACA. TRUMP WON! If I remember correctly a former president shut off all discussion with these words - I WON. End of discussion. Big windstorm around 5:30 yesterday afternoon. It seemed to come out of nowhere with gust of 53 mph and visibility down to ½ mile. It did blow some of the old smoke out but refresh the valley with some new just not as much. There were still some cloud cover this morning and we got a few sprinkles while walking but they move on by 7-8:00. Went to town on another shopping expedition with a stop at The Griddle for Corned Beef Hash & Poached Eggs. It was good but the sourdough toast was a disappointment and the price was excessive. They do a great business and there was a Winnemucca police car in the parking lot so it is well recommended. I filled Desperado with gas last week at the station, next door to the market, which had the lowest prices that I saw as I was driving through town. I noticed that prices had gone up at all the stations that I passed on the way in this morning. Sure enough the station where I got gas last week was up 16¢ but still the lowest. I have read about rising gas prices on the east coast because of Harvey but I'm in Nevada. Sixteen cents in one week - what is going on? After getting groceries I stopped at Laundry Lane to do my laundry. The Park has a laundry but I didn't even go into it. There are no windows so it has to be a little cave. It is also over a ¼ mile round trip from my space although I could park right outside like I have done at Laundry Lane. I finally finished this pixel art. It was not that difficult but I have been spending more time doing research for my Governor trade. I get started on that and the 'research tree' takes me afar. I now will get started on stained glass panel #44 - soon. Not doing much of anything else. Patches and I did set a new one walk distance record yesterday per my Garmin watch that keeps track of such things. That was 3.21 miles with no rests stops only short pauses by Patches which causes me to pause also of course. Doing some cooking today. Making up another batch of breakfast meals. Last time I whipped up some I threw 14 grams of Baker's chocolate into the pot of cooking barley. That turned out tasting pretty good so this time I used 28 grams. Made up some more sardine and potato patties for 'linners'. I'll cook some more salmon fillets but probably put that off until tomorrow. Sen. Rand Paul of Kentucky proposed an amendment to the House-passed $7.85 billion Harvey aid package that would have taken $10 billion from the USAID budget. Now this seems an extremely logical thing to do. The USAID money is borrowed and then given away to foreign county dictators to buy their 'allegiance'. The House-passed aid package will use more borrowed money which required an increase in the United States debt limit. So naturally the Senate voted Yea to table the amendment 87-10. The most surprising vote was by Senator Flake, my other Senator along with the prisoner of war hero, who voted in favor of the amendment. I am guessing that he was 'allowed' to do that because he is trailing badly in the polls against a primary opponent and needed this vote to show how strongly he is against government spending and increased governmental debt. He thinks the 'deplorables' in Arizona are so stupid - but then again, he is probably right they re-elected the prisoner of war hero. Then to top it off Harvey has been virtually forgotten by the Lame Stream Media a week after it was the only News. "…why are the Republicans, siege howitzers of patriotism, presumably conservative, tap dancing away from the issue like anthrax while supporting immigration with their left hands? All sorts of anti-immigrant things could be done, but Republicans do none of them. So why is it the so why is it the hippy-homo-prevert etceteras? Why no Republican action? We got a little wet yesterday afternoon on our walk. There was sunshine all around but we had this one black cloud hanging over us that unleashed just enough rain to get the road and us dog shaking wet. Probably not recorded by any local weather station and if so it was probably a trace. This morning after breakfast it was partly cloudy, 60° with a 4 mph wind. Perfect weather for dumping holding tanks rather than wait until I see the gray water backing up in the shower. That was going to happen soon so doing the dumps this morning was the thing to do. I'll believe it when I see it but the weather experts think that today and tomorrow will be below 90° and starting Thursday through the end of the forecast will be below 80°. The same forecast for my next camp with all the high temperatures lower by a degree or two. Maybe, just maybe I have made it through this summer. I checked Weather Underground this morning and found that the problems that I was having with their site was - they were improving it. It now provides the same information that it always did but in different locations with bigger and bolder presentations of selected data. Perhaps making the placement of the advertising more advantages. I'll give them another week or two and then probably go back to their site as my weather guessers of choice because of their many reporting stations that give reports where I end up living. "I believe it is time to change the subject. The important question is who is it that is trying so hard to convince Americans that Russian influence prevails over us? I received my replacement USB cable for the Paperwhite and everything is working fine. The projected delivery was to be between 12-15 September so I am very pleased not only with the cable but the earlier delivery. This cable appears much more robust and is 5' long rather than the 3' original. That means I can keep the Paperwhite out of my chair, I'm surprised that I didn't bend the connector before now. Nothing of note happening here. I will get the salmon fillets cooked and that will probably be the highlight of my day. I did get started on Panel #44 and perhaps will get some more of it drawn today. Also drawing another very small pixel art piece that has two colors per the pattern but I have added a third color as a border. I read an article this morning that just added one more reason for me to continue living the mobile lifestyle and having nothing to do with Facebook. They have created a map showing where every single person on the planet lives. The mapping technology, which Facebook says it developed itself, can pinpoint any man-made structures in any country on Earth to a resolution of 15 feet. Nothing on my To Do List for today except read more of the two books that I have on my Paperwhite. 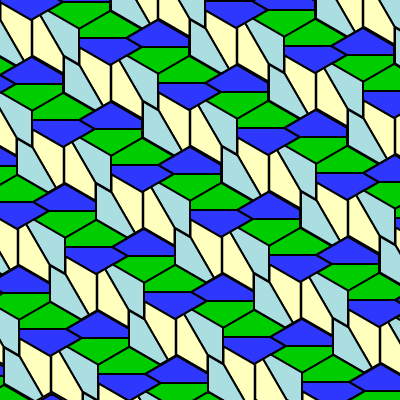 I'll probably finish drawing the latest pixel art piece and start pentagonal Type 11. If the weather guessers are right today will be the last day that I will have a daily high temperature over 90 while I'm here. The next camp is showing none over 90 in the forecast after my arrival there. We got a little wet again this morning. It started to sprinkle when we were only about ¼ mile into our walk but that became a dog shaking light rain by the 1 mile mark. I called a retreat but not soon enough to remain dry. We didn't get soaked but did get wet. “A democracy cannot exist as a permanent form of government. It can only exist until the voters discover that they can vote themselves largesse from the public treasury. From that moment on, the majority always votes for the candidates promising the most benefits from the public treasury with the result that a democracy always collapses over loose fiscal policy, always followed by a dictatorship. I found no customer reviews for this book which is not surprising, it is not on most reading lists. The first 3/4th of the book is an enjoyable read but then he closes it with more socialist/communist utopia ramblings. It is something to read only if you are reading everything that can be found that he wrote. We did our last shopping trip in Winnemucca this morning after a little shorter morning walk. With the temperatures getting to be a bit more reasonable in the afternoon I think we will go back to doing 2 miles each morning and afternoon. Maybe get up a little later if Patches will let me, we are now doing most of the morning walk in the dark. Speaking of weather, the high yesterday was 88° with and expected 87 for today. Nothing too exciting about that except they were below 90. But look at what the gurus are predicting for Friday - high of 68° and a low of 33° Saturday morning. I think it may be time to break out the wither gear. From summer to winter in the same week - that is true Northern Nevada weather. The breakfast stop was at The Garden Restaurant which is in the Winnemucca Inn casino and hotel. I had their Mediterranean Omelet with hash browns, sourdough toast and coffee. The omelet was good, the hash browns were overdone (crispy), the coffee was good and the sourdough was the best that I have had in some time - not great but the best of the poor lot that I have received of late. Got started on my housecleaning prior to leaving this camp. I should have most of it done today with Desperado's cab and windows saved for tomorrow. Patches sheds year around but she really gets naked during the summer months, I'll be happy to see less fur on the floor next month. Same amount of window slobber. The low temperature was 54 this morning while we were out walking. A slight breeze made it feel even colder which it is forecast to be tomorrow morning at 40, with a chance of rain, and Saturday morning reduced to 32°. Just a week ago the high and low were 20 degrees warmer. 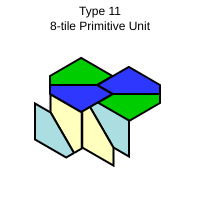 This Type 11 Pentagonal is the second one that Marjorie Rice discovered. It was very easy to draw. Perhaps I am learning something as I do more of these. 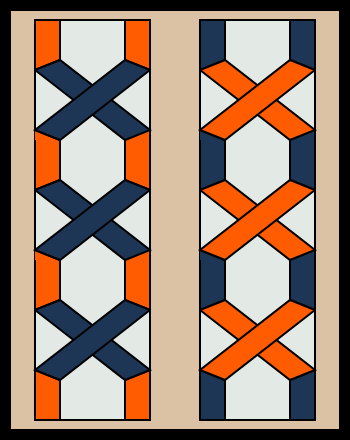 The colors that I have selected are close to what is shown in Wikipedia and I'll be using them for all four of Rice's pentagonal types. I was going to do some more pixel art drawing last night but before I started I wanted to see if I could not keep the PDF pattern from scrolling when I touched the touchpad on my Toshiba. It my attempt to do so I lost the cursor and spent about an hour getting it back. Don't know what I did to lose it nor to restore it. I guess I will leave well enough alone and try drawing more today. The Petro$ got bitchslapped again yesterday. Apparently confirming what President Maduro had warned following the recent US sanctions, The Wall Street Journal reports that Venezuela has officially stopped accepting US Dollars as payment for its crude oil exports. This is another strike against the $ as a reserve currency also. It will not lose that position overnight but it is on its way to joining the Pound Sterling that ruled finance while England ruled the oceans of the world. This is the logo of the Cell C Sharks, a South African rugby union team based in Durban, competing in the Super Rugby competition. I had never heard of them or the Super Rugby league which has teams from countries in the southern hemisphere plus Japan. I liked the logo and it has made a good pixel art piece. There is a big difference in what is being reported as the low temperature this morning. Weather Underground claims that it was 39.9° and a calculated wind chill of 37. The National Weather Service is reporting the low to have been 33° wind chill at 27. My guess is that it was probably somewhere between those numbers - COLD. The forecast low for tomorrow morning is also divergent: NWS-39, Weather Channel 31, Weather Underground 32. I'll be wearing my winter gear! I let it warm up a bit before washing Desperado's windows this morning. That almost completes all the cleaning I'll do prior to leaving. I will do the stovetop and counter after 'linner' tomorrow. I may or may not take on fresh water and dump holding tanks tomorrow morning. Undecided. I Explain the Persuasion Techniques President Trump is using on The Wall and DACA by Scott Adams aka Dilbert is a recommended read. This black cat is very small and the second color is only in the eyes which required a total of 16 pixels. I was able to draw it in about an hour including the time it took to save it as a transparent PNG file and upload it to my Google Drive. I have some more two color cross stitch patterns that are a lot more involved than this. I'll be drawing them at the same time that I am working on Panel #45 which uses #44 as a base. Infantry Attacks (German: Infanterie Greift An) is a classic book on military tactics written by Erwin Rommel about his experiences in World War I. I read it on my Paperwhite from a converted PDF file and the sketches were very small, it would be a much better read from the PDF. Wikipedia has a very good web page for the book and the customer reviewer at goodreads.com says it well. There is the same disparity in reported temperatures this morning as there was yesterday. The National Weather Service is reporting a low of 28° wind chill of 19 whereas Weather Underground says it was only 35.7° and a calculated wind chill of 33. Once again I'll go with a number somewhere between the two and say it was below freezing. It stayed cold also somewhere between 37 and 42 at 7:45 this morning. With an expected high of 72-70 versus the 64-68 of yesterday. In November 2000 Baghdad's switch from the dollar to the euro for the pricing of its oil rebuking Washington's hard-line on sanctions. It took former president Bush a long time to retaliate but Saddam paid for that rebuke with his life. Gaddafi also proposed in 2011 that the oil from Libya would be sold in some currency other than the United States dollar - he died on October 20, 2011. Now Maduro of Venezuela has priced that country's oil in Yuan as a rebuke against United States sanctions. Anyone want to bet on how long he has to live? Today was a travel day. I intended on having breakfast at La Casita in Lovelock, NV but they were closed as was all of 'downtown' Lovelock. It looked like the place had been hit by a neutron bomb. I did find the Black Rock Grill open in the C Punch Inn & Casino which had a good crowd. Not that they served up a great breakfast but what recommended them was they were OPEN. Stopped in Fallon, NV for gas because it was cheaper than in Hawthorne. Not cheap mind you, I said cheaper. The route today was only 204 miles and rather straight forward: Rim Rock Rd, Winnemucca Blvd, I-80 (74 miles), Main St, Cornell Av (in Lovelock), I-80 (22 miles), US95, US50 & US95. When I got to Walker Lake it looked to be full, at least no bathtub ring was showing and it had the most water in it that I have seen. It is still almost 21' below maximum although it added 9' this past year. When full it is only 68' deep at its deepest point but would cover a vast area. The RV Park here is new, probably less than 5 years old. I have driven past it 2-3 times but this will be my first stay. It has to be hot as hell in the summer and cold, cold in the winter. That means there are about 2 months during the year when it will be pleasant to stay here. I hope I have selected one of those months! All the spaces have cement pads and are pull throughs. The roads through the Park are well graveled. Each space has a tree that is now about 10-12' tall that provides very little shade and electric is not metered. So far it is very quiet with a neighbor on only my right side. I think I'm going to like it. Yesterday I commented on two oil country leaders that challenged the dominance of the Petro/Reserve$ and died soon after doing so. Now Maduro of Venezuela has done it also but the heavy hitters are Russia and China. It is those two countries leading the BRICS and Shanghai Cooperation Organization plus China's New Silk Road that has the Establishment willing to go to war, one that the United States can not win, to protect the $. This is a far more serious issue than any attempt by Russia/Putin to influence the 2016 election. The Lame Stream Media has ignored it! I presume they have done so upon instructions from the Establishment that know their house of cards is under a serious attack but do not want the 'deplorables' to know it also. More bread and circus plus beat the war drum. I mentioned the trees that were here in the Park. What I did not say is they are of various kinds and some of them have leaves that are changing color. The Weather Channel claims that it was below freezing during this past weekend but neither NWS or Underground are reporting low temperatures nearly that cold. I think it was in the low 50s this morning which was very nice as was the high of 80. When I was in Pocatello I stopped at a McDonald's about once or twice a week and got a latte. It was good, there they had a place to sit outside with Patches. I stopped at the one here in Hawthorne this morning and got one which was poor, tepid and no place to sit outside. Probably my last stop there for a latte - coffee maybe. Ringgold Wilmer "Ring" Lardner was an American sports columnist and short story writer best known for his satirical writings about sports, marriage, and the theatre. He was a contemporary of Ernest Hemingway, Virginia Woolf and F. Scott Fitzgerald, all of whom professed strong admiration for Lardner's writing. He was also a contemporary of H. L. Menken and Will Rogers with a written vernacular that took Will's to the extreme and antithetical to Mencken's. There are a few reviews of this book which was a sequel of sorts to his more popular You Know Me Al but they are mixed in their opinion. You either like the vernacular or you don't, you either like the corny jokes or you don't. I thought it was a fun read and his characters 'talk' like some of my relatives from that era talked. Recommended to those that have an open mind and do not expect another Infantry Attacks although it takes place during WWI. Cooked more breakfast meals this morning. I might get around to making up some more sardine and potato patties today but most likely tomorrow. That is about all that I have happening other than reading and more drawing. I have the hard part of Panel #45 drawn and making slow progress on the pixel art piece. His holding that belief is why the Leftist hate him so much. It has nothing to do with slavery but has everything to do with his prescience. I got some good news and bad news yesterday. The bad news first. My A/C appears to have died. It did not seem to be cooling very well the afternoon that I got here. Then late in the afternoon there was a smell that I associate with an overheated electrical appliance. I looked around but did not consider the A/C because it was cool enough by then that I didn't need it. This afternoon I need it and I found that the circuit breaker had been tripped and re-setting it did nothing. The good news is that the 10 Day Forecast claims that I will not need any A/C. I have contacted a shop at my next camp that got good reviews in RV Service Reviews. If I can not get it looked at, and fixed, while there I'll get it done in Yuma where I am going to 'winter over'. The other bad news is I have had a psoriatic arthritis flare-up these past couple weeks. It has manifested in an attack on the tendons in my hands, shoulders, hamstrings, those that connect to the sartorius muscle (I think), knees and feet. Started a regimen of ibuprofen and acetaminophen when it got to hurting more than usual. The last time this happened I did not start any inflammation treatment until I was at a point where I could barely walk. Started earlier this time but it is not a quick cure. Requested prescriptions and advice from the VA yesterday but it will take some time for them to respond - IF they do. Shopping day. But first there was breakfast at El Capitan. This is probably going to be my routine every shopping day. From what I saw this morning El Capitan is the only restaurant open before 7:00 and Safeway is the only market in town. I walked into town with the stop at McDonald's along US95 yesterday morning but will not be doing that again. There are 4 lanes but the traffic insists on staying to the right where there is only a three foot shoulder. The better walking area is to be had in Babbitt which is now a lot of cement slabs and very deteriorated roads. This pair of Panel #45 is very much like those of #44 which I used for the base measurements. It did require coding change of course but not like starting from scratch, I am not going to be so lucky with Panel #46. A few days ago when I dumped holding tanks I had a painful time getting the sewer hose connections connected and disconnected. The psoriatic arthritis in my hands is making it almost impossible to do it. Yesterday I ordered a RV sewer hose wrench that I hope will arrive in time to make the next dump less uncomfortable. The high temperature yesterday was 70° so no A/C needed however Desperado could get warm with todays forecast of 79 if I can not get some cross ventilation. But tomorrow, if the projected 62 with chance of rain happens, I'll be complaining about it being too cold. The morning lows are moving down into my 'winter gear' range by next week also so I'll be whining about the mornings being cold. Another small slap at the Petro/Reserve$. Russian President Vladimir Putin has instructed the government to approve legislation making the ruble the main currency of exchange at all Russian seaports by next year. This will force foreigners to buy Russian currency to pay the port tariffs that have previously been paid in US dollars. I think President Trump told the United Nations what three countries are next on its regime change list. Venezuela probably will be the first to be attacked and the Establishment will see how that goes down domestically and internationally. If it is accepted without too many squawks then Kim of North Korea will be at serious risk. Iran is a much more difficult issue because Russia and China both will get involved in anything the United States might do overtly there. "No one has shown more contempt for other nations and for the well-being of their own people than the depraved regime in North Korea. It is responsible for the starvation deaths of millions of north Koreans...The United States has great strength and patience, but if it is forced to defend itself or its allies, we will have no choice but to totally destroy North Korea. The Venezuelan people are starving and their country is collapsing. Their democratic institutions are being destroyed. The situation is completely unacceptable, and we cannot stand by and watch...The United States has taken important steps to hold the regime accountable. We are prepared to take further action if the government of Venezuela persists on its path to impose authoritarian rule on the Venezuelan people. "One wonders if the rest of the world, especially Russia and China, got Washington’s message. Washington’s plan for UN “reform” is a plan to turn the organization into another instrument of US foreign policy, like NATO and the EU. The message that Trump was sent to deliver to the UN is that henceforth the UN is expected to support Washington’s foreign policy agenda. Opponents to Washington’s war policy are to be isolated and lumped together with the bad countries as defined by Washington. We did a very abbreviated walk this morning. I heard it raining in the early hours and then again when I woke up a little before get up time. When we went out it was drizzling enough that Patches was shaking it off before we even got out of the Park. Turned around and went back to the comfort of Desperado. Very dark clouds all morning which look like they could dump some more water. The experts give it a 60% chance of raining more by 2:00 this afternoon so we might be able to do an afternoon walk. It will be cool one if we do the high temperature forecast has been dropped to 58° from the original low 60s. Another 58 expected tomorrow and not back into the 70s until Thursday but low 80s by the end of the month. I read these short stories once before in The Country of the Blind, And Other Stories which had 23 short stories (reviewed 2 June 2016). I realized that I had read each one of them before as I started on them but they are enjoyable even if read more than once. The customer review make mention of specific ones but I liked all 17. The weather guessers got it all wrong about the rain yesterday. It didn't really get started until 2:00 in the afternoon. At 3:30 we tried to go do our walk between squalls but got caught and wetter than we had it the morning. Heavy rain starting at 4:00. Total for the day was 0.41" which is a lot for this part of the country. It was not just rain but there was SNOW mixed in with it not a lot but enough to partially cover the ground in some places. SNOW! The mountain peak directly in front of me ( looking northwest) has a light blanket on its summit this morning. That will soon be gone when the cloud cover goes away and the sun get to it. I think it is at about 8,000' and there was some showing on a couple of lower peaks (maybe 6,000') early this morning but was gone by 7:30. I was going to go for a latte yesterday but that got rain out. We got there this morning. There is an espresso shack about 2 blocks from where I turned around and went to McDonald's a few days ago. A decent latte and they have bagels so we will be going back. Patches does love her bagels and cream cheese. But there is nothing that I have offered her that she does not like! I am curious to know what happened to the News coverage of Harvey and Irma? Irma was being touted as the most devastating hurricane ever, prior to it hitting. It came, it blew and then it left and the News coverage went with it - crickets! I seem to remember that Katrina merited coverage for days, if not weeks, after it blew into New Orleans. I'm also curious about what happened to hurricanes J, K and L. All the News is now about Maria and how it wiped out Puerto Rico ( I thought everyone from Puerto Rico had already moved to New York City). The Commonwealth is bankrupt and now the infrastructure has been wiped out. A clean slate so to speak, they can start over and create a socialistic utopia using United States taxpayer money - what an opportunity! I can see the wheels turning quickly in Washington for Maria 'relief' although Harvey and Irma have become rather old News. I have made some good progress in drawing pentagonal Type #12 these past couple of days. Haven't done anything more with the pixel art piece that was started, maybe get back to it today and this weekend. With the temperature at 10:00 yesterday only up to 48° with a projected high of 55 I thought it was time to break out the Wave 6. The Piezo electric spark starter had vibrated loose and was hanging outside the casing by its wiring. I messed with it for about a ½ hour and managed to get it screwed back in place and got the Wave fired up. Patches approved - crowded in front of it with her feet to the fire as if it was started up for her benefit. I do not understand Weather Underground and NWS temperature reporting. The both claim they are using the Hawthorne Municipal Airport Station (KHTH) but report different high and low temperatures. Depending on which one you want to believe to be correct the high yesterday was either 51 or 52 and the low this morning was 35 or 36. Then Weather Underground is forecasting that today will be Nearly The Same with a high of 59. How do you get Nearly The Same with a 7-8 degree difference in temperature? The NWS however think the high will reach 62. The 'experts' cannot agree on an forecast for today (much less what the actual historical temperatures were) yet we are to believe that there is a consensus of scientist that know what the climate will be like 50 years from now? I received the RV sewer hose wrenches that I ordered. Delivered by UPS to the Park office and the fellow that was working yesterday brought the package to me. There seems to be a different person working the office everyday that I have gone in there. All of them have been men which is a little surprising. I have seen men working the office desk before but most of the time it is women. There is a Camp Host also but I think they only take care of customers outside of office hours. 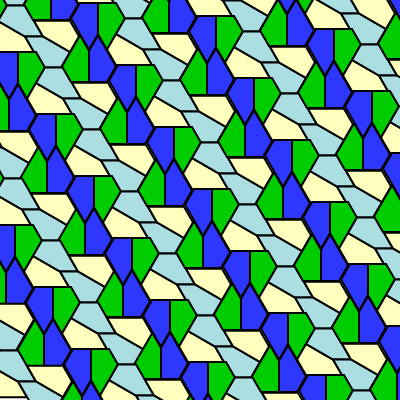 This Type 12 Pentagonal is the third that Marjorie Rice discovered. It was not as easy to draw as the Type 11. Perhaps I am learning something as I do more of these but I still have a lot to learn. 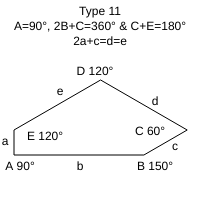 What made the Type 11 so easy was I guessed what the side lengths needed to be on the first guess. It took more guesses for this one. 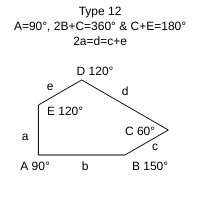 There is a mathematical way of determining what the lengths need to be with the angles that have been selected but that way is not in my knowledge base. Because of my hearing the town fireworks these past couple of night have not bothered me. It has had Patches upset however. She seems to react more to fireworks than to gun shots for some reason. Continuing to follow my regimen to alleviate the psoratic arthritis pains. I have made two VA requests for prescriptions and/or advise on what I should be doing. Have received - Nothing! So, I am now in pain and angry. VA has always been responsive in the past I'm unsure what may have changed other than President Trump. There certainly are people that want to do everything they can to turn people against him, some of them may be at the VA. What are the chances? A rather easy pixel art piece that allowed for a lot of bucket fill of color. For the cross stitch pattern the white doves were not stitched allowing the background to show through as white. I wanted a transparent background so used an off white making this a three color drawing but still rather simple. More problems with electronic stuff. I shut my Paperwhite down last night just like I always do and then this morning when I open the cover I see a Screen Saver and it is frozen on it. The only part of a Paperwhite that does anything other than from a screen touch is the power input and a Power Button. Held the Button down until a green light went out but that did nothing. After I finished breakfast at Maggie's Once More (I think the story behind the name is there was a Maggie's that closed) and got Desperado into her space at the Park I went to the Internet. I needed to hold the Power Button down for 20 seconds or 30 seconds depending on who was providing the instructions. I held the Button down until it looked like the Paperwhite was coming to life again. Once more all is well with my Paperwhite. Maggie's is open at 7:00 during the week but at 8:00 on the weekends. I'll probably go back there at least one more time while I'm here, there are not many choices. The build your own omelet was pretty good, the sourdough toast was white bread with the sourdough name, the home fries were very good and the coffee was very good. The price was a bit steep for what I got and I was not paying anything extra in a tourist town nor for ambiance. There is another upper 60s high temperature forecast for today and then the remainder of the 10 Day Forecast is in the 70s with maybe an 80 on Saturday and Sunday. The morning lows are also moving back up into the 50s. IF this can only come true I should experience a great 10 days of weather. My experience with RV Park WIFI has been very poor for the most part since I have been living on the road. If you happen to be near the main modem, usually the Park office, then you might get acceptable WIFI. Anyplace else in the Park is usually going to be bad or worse. Here I can see the WIFI repeater on a pole and I do receive a signal but it is extremely slow. I downloaded and installed some 80+Mb of Linux/Ubuntu upgrades and security to my Toshiba yesterday which took well over an hour. There have been times when I could not get it to upload a pixel art piece PGN file that was less than 1Mb before it would lose the connection. If you plan on using Park WIFIs for your internet needs you will need far more patience that I have. Just an entertainment book that I think the customer review covers well although they gave it only 3 stars. President Trump does know how to stir up a hornets nest. His poking the NFL nest and dis-inviting sport multi-millionaires to the White House will be making News for a lot longer than the usual 3 day cycle. But I tend to agree with some of his leftist critics - he is crazy, crazy as a fox. He knows who his voting base is and his poking will pay big dividends in future elections. In the United States, nearly one out of every three adults is a NASCAR fan. The largest NASCAR arena holds 190,000 spectators while the largest NFL stadiums feature a maximum occupancy of 60,000 to 80,000. With an estimated $3 billion per year in sponsorships, two times more than the NFL, NASCAR is also the most financially lucrative spectator sport in the United States. These fans are the "deplorables" that the left simply can not abide but they will certainly support President Trump in his 'attack' on disrespectful sport 'heros'. "In 2010, McCain was promising to complete “the danged fence”. A few years later he had gotten busy on amnesty for illegal aliens. In 2016, McCain was promising to lead to fight against ObamaCare. A year later he’s leading the fight to keep ObamaCare. The only good thing that can be said about McCain’s strategic dishonesty is that the intervals between his elections and his betrayals have grown shorter. Once upon a time, McCain deserved to be called, “honorable”. Unlike his friend, John Kerry, who threw away his medals in one shot, McCain threw away his honor slowly, year by year. Now he has none left. Senator McCain’s legacy will be McCainCare. It won’t be a bill that he introduced or voted on. Instead his legacy will be the misery he has caused by supporting a failed Dem health care status quo. I waited for it to warm up a little and for the sun to get on the side of Desperado where I needed to dump holding tanks yesterday. The new RV sewer hose wrenches worked great. No hand pain at all compared to what I suffered the last time I dumped tanks. No pain compared to what I suffer getting a new bottle of olive oil open. A bottle/jar opener is next on my Wish List. 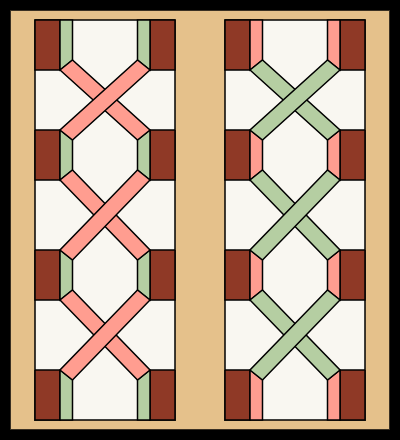 This pair of Panel #46s are close to what is shown at the free stained glass web page but I got the measurements slightly wrong for it to be a reproduction. It does look good even if not quite the same. 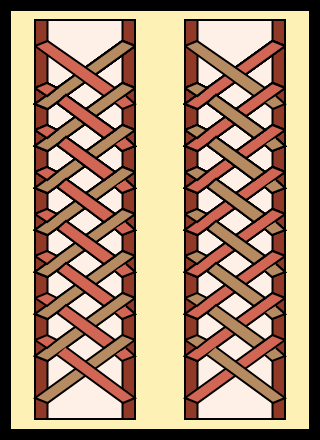 Panels #47 & #48 are also weave patterns that are even more complex than this one. I'm going to give them a go but know just by looking at them that they are going to take some time. I made a good start on pentagonal Type 13 yesterday but it took me a lot of time. 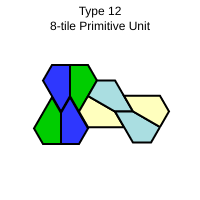 The single tile was reasonably easy to draw but I had a lot of trouble with the Primitive Unit. What I have ended up with so far is fitting together but the tiles are a different angle than what is shown on the Wikipedia web page. That really does not mean all that much IF I can get all 8 tiles to fit. Did a little bit of work on the latest pixel art piece and more couch time with my Paperwhite. That and a morning walk to the espresso shop is about all I have going on. I have been getting a bunch of Spam from Sherrod Brown wanting me to contribute to his primary campaign. Why me? I am not registered to vote in Ohio, certainly have never been a contributor to any other Democrat. He is trailing in the polls and I guess he has hired someone that bought email addresses and my email was among them. You want to get some idea of what the United States will undergo after the Progressive Democrat Party gets back into power? Read A Fractured Civilization: The European Union at Sixty by Bruce S. Thornton. There is a closing segment of the article A Warning for America? that should be read at the very least although it is only 54 pages in total length. His closing: "The battle to restore America’s unique character, political freedom, and national goodness––and to reject the model of E.U.’s failing utopia––has just begun." I didn't like the way the pentagonal Type 13 Unit was looking although I did manage to get it to 'fit'. What did not fit was when I tried to do a tiling with the units. I discovered the single tile was drawn wrong as well so I am back where I was a little over a day ago with this drawing. I think (?) I now have the side lengths correct but only time and more drawing will tell. I made up some more sardine and potato patties yesterday. I might get around to cooking some cod today but more likely tomorrow to make some modified Pescado a la Veracruzana. I haven't complained about the weather recently. The only reason for that is there was nothing to complain about. The past week, since we had the rainy day and a couple of cold days, has been about as good as it gets for northern Nevada. If I am to believe the 10 Day forecast there is another good week in the offing. I made up a batch of breakfast meals this morning. Maybe get that cod into the Roaster before the day is done, if not there is always tomorrow. I only selected this book because it was included in the Gutenberg list of H. G. Wells books but he only wrote the introduction. Margaret Sanger had many of the same ideas that he did about the world needing a New Republican/Superman or what ever Wells was calling this "new man" of the future at the time he wrote about him. She did not agree with most of the Eugenicist of her time but was very much in support of 'removing' the unfit and increasing the fit. Her focus was on education and contraception when she founded the American Birth Control League, which later became the Planned Parenthood Federation of America. It has been the Progressive feminist of more recent years that have pushed abortion as a means of contraception. Much of what she believed would be called 'conservative thinking' in the United States of today. I have said many times that the more things change the more they remain the same. Hiram Johnson was a Senator (1917-1945) from California that ran on the Bull Moose ticket with Teddy Roosevelt and also sought the Republican presidential nomination twice. You might consider him the 'maverick' Republican of the early 20th Century.